Growing Your Baby features an easy and adorable, eco-friendly craft we can all relate to (and readily have the supplies for! 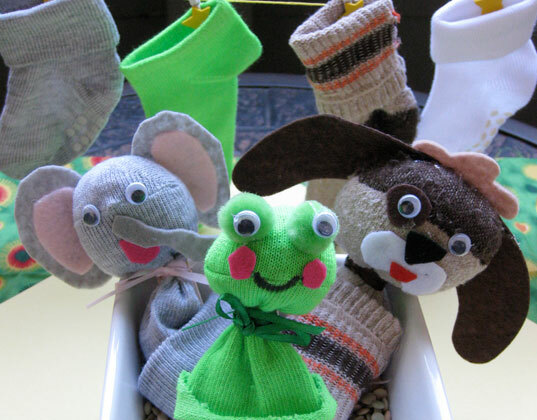 ): finger puppets made out of stray baby socks! Ohdeedoh unearths a rare find: pirouette pinwheels made of felt. Sold in colorful bouquets of 8, these pinwheels would make the perfect green party favors for spring and summer birthday parties. LMNOP highlights teepees made from recycled yacht sailcloths — ideal backdrops for kids to drift into a sea of fun and adventure this summer. Babyccino rightfully raves about unique designs handmade by Aly Peel of Maiike, who sources old woolen and cashmere jumpers from second-hand and vintage stores and upcycles them into patchwork squares for cushions, scarves and quilts. Design Mom shares a ‘brilliant fix’ from green living expert Danny Seo: a chalkboard fridge that moms and dads can use as a giant note board, and kids can use as entertainment. Post-it notes be gone!